Photo courtesy of Bob Pristash and the Evansville Purple Aces men's basketball twitter handle (@UEAthletics_MBB). Move over Colt Ryan! With 18 second-half points, Evansville Purple Aces' superstar D.J. Balentine netted his 2,280th point, one more than the former UE all-time scorer Ryan had in his career. EVANSVILLE, INDIANA---It was a very early start in Southern Indiana for today's Missouri Valley Conference matchup between D.J. Balentine's Evansville Purple Aces and Dequon Miller's Missouri State Bears. Also, it was somewhat of an early exit from competitiveness for the road team, since JB, Jaylon Brown, and D.J., D.J. 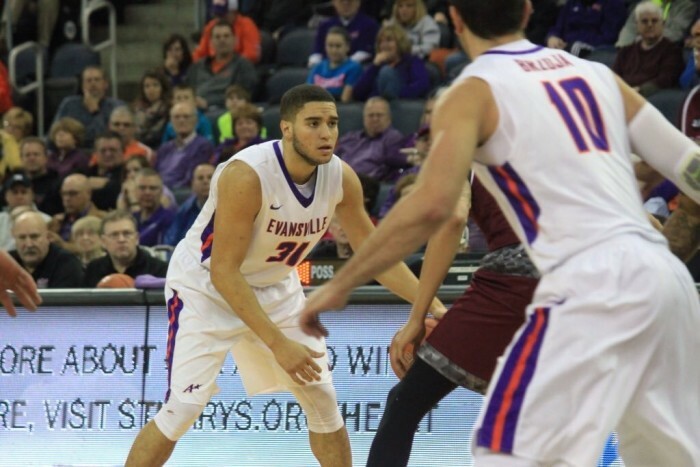 Balentine, paced the Purple Aces with 19 and 18 points respectively in a very controlled 83-64 victory. Despite the first two minutes having very little scoring (3-2 UE), Evansville's Jaylon Brown and Missouri State's Camyn Boone were cups of espresso for their respective teams, by supplying 9 of the first 14 total points heading into the first media timeout (8-6 UE). Ensuing some back-and-forth action between the two, Purple Aces' junior Mislav Brzoja spurred a 9-0 spurt with 7 of his 13, to transform his team's four point lead into thirteen (25-12 UE). Despite Missouri State finally stringing baskets together with deuces from Jarred Dixon, Ryan Kreklow, and "jazzy junior" Dequon Miller, Evansville swiftly recovered to re-up their edge to double-figures heading into halftime thanks to Willie Wiley III producing more points (5) in a three-minute segment than he had in his last five games (3). Evansville, leaving the intermission with a 13-point advantage, utilized a quick 10-4 run, six of which were supplied by Brown, to give themselves a 19-point edge (50-31 UE). Three and a half minutes later, Evansville, who eventually moved the margin to 22 on three more from Wiley III, seemed to have the game in hand. However, the Bears were not going into hibernation so soon. Propelled by three more of Miller's ten, Missouri State came roaring back to make it a 13-point game with nine unanswered. But in a game in which, D.J. Balentine passed legend Colt Ryan for points scored at Evansville, thanks to 10 of his 18 coming in the final 6:25, there was no way Paul Lusk's group had any chance of spoiling the Purple Aces' superstar's accomplishment. Evansville's Mislav Brzoja chipped in four to take the lead to a new height of 24 prior to jogging to a 19-point win. Posting double-digits in the first seven of nine MVC contests, "jazzy junior" Jaylon Brown hit a rough patch, along with the rest of his team, upon hosting Wichita State and traveling to snowy Cedar Falls for Northern Iowa as he was held to nine total points. This afternoon, he was back to his normal self. Brown, who really got the ball rolling to start with four immediate, was able to get any shot he wanted. Moreover, he nailed the ones he received from inside and beyond the arc. Swishing three triples and three deuces on eleven attempts and making four-of-four free throws on the day, Brown finished with a game-high 19 points to go along with 5 rebounds and 2 assists. "It's really just playing off of what they do on defense. Coach always tells me to be aggressive, even after the last game when foul trouble keeps you out of the game." said Jaylon Brown on his offensive outburst of a season. "I find spots. And if I am open, I take them." Reunited at home versus Illinois State, Dequon Miller, Chris Kendrix, and Camyn Boone had blasted a pair of Illinois opponents with a combined 47 points last Saturday, led by Miller's 22, and 42 on Tuesday (Chris Kendrix posted a career-high of 21). This Saturday, their efforts were not enough. Although Boone had very early success (10 points and 7 rebounds total), Miller made timely baskets, and Kendrix went off to tie his career-high with 17 in the second twenty minutes (21 points and 7 rebounds), the Bears shot the ball very poorly and finished at 35.9%. Additionally, "The Big Three" had trouble and ended the afternoon a hair over 40% from the field. Also turning in solid performances for Missouri State were "fab freshmen" Ryan Kreklow and Jarred Dixon as they scored eight and six separately. Tyler McCullough finished with seven points and eight rebounds. 10-14 (6-6) Missouri State will travel back home for practices before hitting the road again, this time for a matchup at Northern Iowa on Wednesday. In consideration to both teams entering on opposite ends of the spectrum--Missouri State was on a two game winning streak while Evansville was losers of two straight--today's bout had the potential to mold the Missouri Valley Conference into a closely knit ball of clay between the second and sixth spots. Unfortunately for the Bears, the Purple Aces avoided such a scenario. Led by four double-figure scorers, including Egidijus Mockevicius, who finished with a double-double, Evansville led from start to finish while shooting 44.6% from the floor. Furthermore, they were able to solve Missouri State's 2-3 zone in the first half prior to having a higher scoring second upon being guarded man-to-man. "He hurt his knee against Bradley, and it's going to require surgery." ---Missouri State head coach Paul Lusk on senior guard Dorrian Williams. In what has been an "up and down" season for Bears' senior Dorrian Williams, the low just became a whole lot deeper for it sounds as though he may be out for the season. A 6'3" guard, Williams has been a senior leader in addition to a contributor of points (7.6 PPG), rebounds (4.5 RPG), and assists (4.1 APG). Expect freshman Ryan Kreklow to be the beneficiary of the injury. "We fouled too much, we struggled to score and we just didn't get a lot of production from numerous guys. When you come into (Evansville), you're going to have to play better basketball." ---Paul Lusk on his team's performance. "Unbelievable. There are no words that I can really use to describe this feeling. Just to be able to do it here in front of the home crowd and my teammates being able to embrace me like that. It's an amazing feeling, and I'm gracious for that." ---The University of Evansville's all-time leading scorer D.J. Balentine. "As soon as he got the ball, he (Jaylon Brown) looked at me and kind of gave me that look like, 'I am going to pass it to you.' So I kind of slowed up. He knew I needed a three as well as everybody. He passed it to me and I knew if I got a look and a little bit of space, it was going to go up. As soon as I shot it, I knew it was good." ---D.J. Balentine on his record breaking shot. "I am sure I will have a message from him (Colt Ryan)." said D.J. Balentine when he was asked whether he has heard from the player he passed, Colt Ryan. "We have a great relationship. We talk here and there when we can. It means a lot to pass him because when I first got here, he taught me how this thing works. How I move, how I act, to bring it every day in practice because it will translate to the game. To pass him is a great feeling. I am not too sure if he is all the way excited for me because his record only lasted three years, but I know he is pretty happy for me."